Home » Events » Galleries | Art » "Contemporary"
Painter Judith Anthony Johnston explores concepts such as spirituality, compassion, faith, honesty and knowledge. She uses color and contrast to serve as a foundation for texture, which she uses to create depth. Combining wax, pigment, oil paint, charcoal, ink, gold leaf and resin, Johnston creates work that allows the viewer to reflect upon meanings that lie below the surface. “My newest work includes adding the human form to my gold leaf work,” she says. 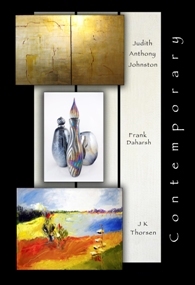 J.K. Thorsen has a bold style; very loose and a little undone. She uses any medium necessary to accomplish her goals. In her latest series, including works on paper, she gives us a personal mix of modern paintings while incorporating more earth-friendly materials.